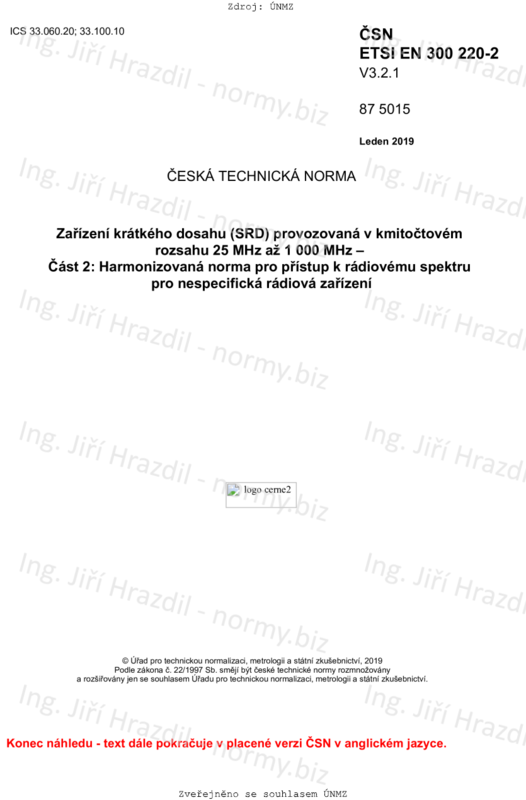 The present document specifies technical characteristics and methods of measurements for Non-specific Short Range Devices category equipment types. "The non-specific short-range device category covers all kinds of radio devices, regardless of the application or the purpose, which fulfil the technical conditions as specified for a given frequency band. Typical uses include telemetry, telecommand, alarms, data transmissions in general and other applications".
" plug-in radio devices intended for use within combined equipment. It is noted that in the European Commission Decision on Short Range Devices [i.3], some harmonised frequency bands may be subject to usage restrictions such as the exclusion of video or audio use. Equipment transmitting voice with analog modulation are excluded from the present document. NOTE: The relationship between the present document and essential requirements of article 3.2 of Directive 2014/53/EU [i.2] is given in annex A.